This weekend my husband helped me organize and reprioritize my sewing projects. There are many events I want or need to make new garments for but I'm constantly distracted by wanting to work with pretty fabrics or inspired by museum images--which leads to procrastinating on smaller but important projects, or rushing and stressing to complete a garment for an event. I dusted off my Newport pocket kit (from Golden Scissors and purchased through Wm Booth Draper) and got to work. index card organizing the threads. I have been procrastinating on this for almost two years, primarily because I wasn't sure where or how to start. 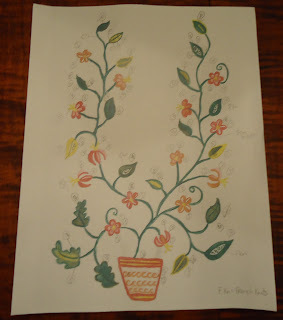 And because crewel embroidery is a new technique for me. Unlike the embroidery kits I've worked with in the past, this kit does not dictate which stitches and threads to use where. All this option for creativity left my wondering how to start. After reviewing the book Eighteenth Century Embroidery Techniques, I mapped out a plan. 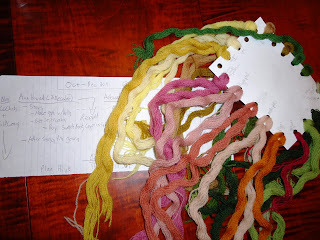 I numbered my threads by creating a fuzzy index card (pictured above) and, using the illustration provide in the kit, I penciled in which colors to use at which spots. I then studied the stitching techniques in my book, and those included with the instructions, and guesstimated which stitches I want to attempt at which spots and noted that on the illustration. My plan for this project. Now I'm happily along my way, wondering why did I wait so long to start this project?? I love embroidery. Love it. I'm not taking about machine embroidery, like a company's logo on a polo shirt. I'm referring to fine fabrics embroidered by hand with beautiful thread. It takes patience and time to create, but watching the product slowly come to life is rather exciting. 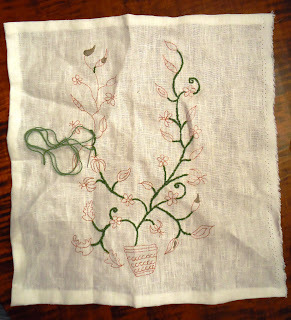 My crewel embroidery stitches are far from perfect. 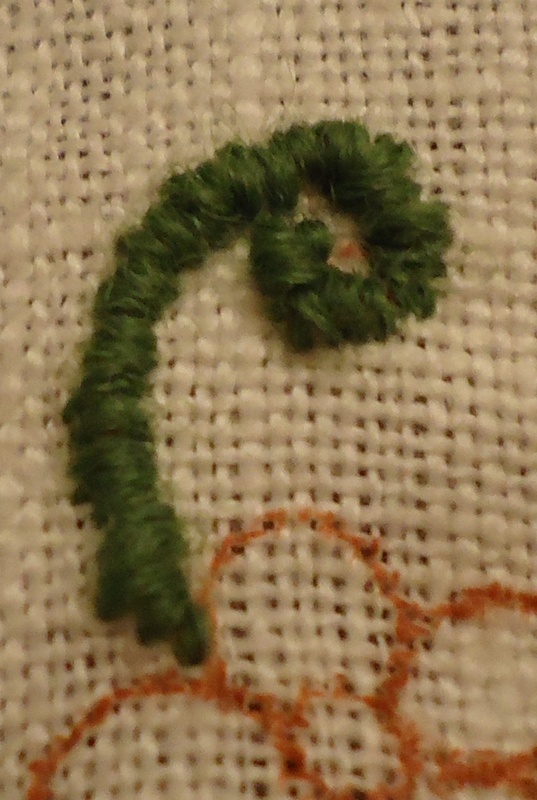 I'm learning through trial and error by studying pictures of a few extant examples and trying to honestly judge if my stitches resemble the real thing. So far nothing looks as good as the museum stuff, but the process is sew much fun. Enjoy! :) It is fun, isn't it? I've recently gotten into embroidery (I still need to get better floss and other supplies, but I've also bought other tools and supplies I never imagined I'd have). 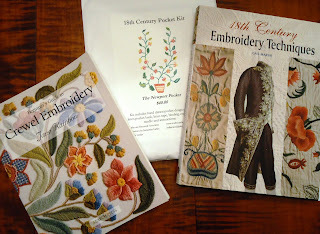 I have the 18th century embroidery techniques book, but hope to have a few more. That crewel book looks nice! 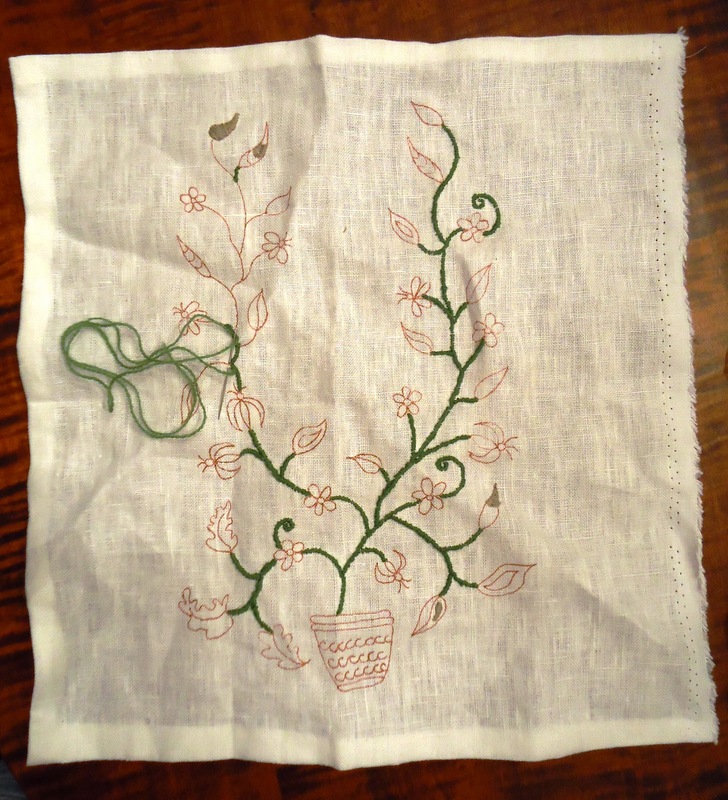 I'm not shooting for 18th century accuracy yet, but I do use the 18th century book along with videos (the Needle N' Thread website has been a HUGE help learning stitches), and it's been a blast finally learning how to do something that usually turned into a mess when I tried it in my younger years. That's looking great! I love embroidery, too. So satisfying when you compelete something. And pretty! The way you keep your floss is really clever. I usually keep them in ziplocs with the floss tags still attched to keep track of the color.